What, you haven't heard yet? The cool kids are all over at http://www.corruptedsave.com, reading about cool stuff like Splinter Cell: Conviction. And working on getting this blog moved to a different solution. League of Legends (LoL) by Riot Games is basically a new iteration of the Defense of the Ancients (DOTA) mod for WarCraft III. LoL is actually free to play, with the revenue stream being from micro-transactions in the game’s store. I really enjoyed my time I spent in LoL’s beta, and when the game was fresh playing in the matchmaking was pretty good until I reached a certain level where the ratio of decent players to complete scum diminished to a point where LoL was no longer any fun. Hearing about Monday Night Combat from PAX East reminded me that I had LoL installed, so I loaded it up to give it another spin. Funny Money Doesn't make a Game more Fun, or even Funny. Updating the client after a few months of inactivity wasn’t a great experience, particularly as one of the patches got stuck in a loop of updating that utterly broke the install. Riot’s support forum basically advocates uninstalling the game and reinstalling. You really do get what you pay for, and this is also indicated by the central game server for LoL, which is incredibly laggy and is a source of major criticism on the official game forums. Without fail, I will also get disconnected from PvP.net, LoL's battle.net-like interface, with a message that I will not be able to "end or receive messages." This has persisted since the beta, which is quite humorous. With the client reinstalled and up to date, I was ready to get into a game. LoL games typically last about 30 minutes, and during that time players assume the control of one hero from a zoomed out, isometric perspective. The hero starts out rather weak, and gradually earns experience and gold for killing enemy AI soldiers, players, and neutral monsters scattered about the map. Each hero has a unique ability-set which increases their power and effectiveness as ability points are earned and spent. Similarly, heroes have six gear slots which can hold vital weapons, armor, and potions. The ultimate goal of LoL and similar games is to push past the enemy defenses and obliterate their base. 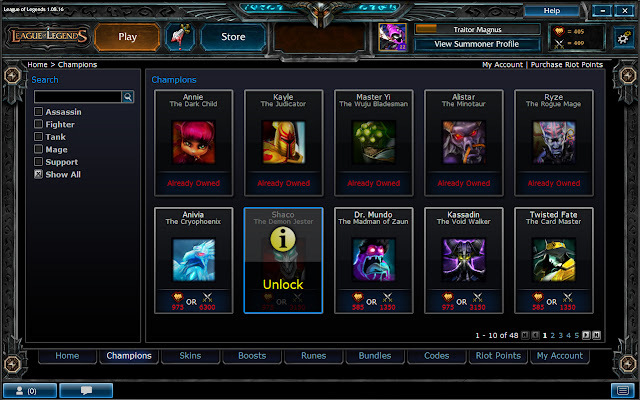 One of the saving graces of LoL is that there is a “practice mode” where players can make their own games outside of the matchmaking functionality, and bots are available to fill player spots. The downside of these practice matches, besides being incredibly easy and not yielding points after a daily limit is reached, is that the experience and influence points that are earned are reduced in comparison to what can be earned in the matchmaking games. These points that I’m talking about are LoL’s major innovation to the DOTA model of game-play, in that the player’s profile is earning experience points with wins and losses. 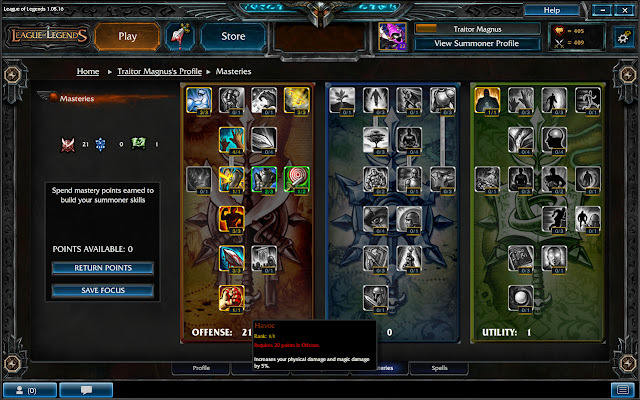 With these points, the player gets skill points to spend in three different stat trees to further enhance their heroes. Persistent Talents, one of LoL's Real Innovations for its Genre. Additionally, the player also gets access to spells that have long cool-downs and have functions like helping the hero make an escape or fortifying tower defenses temporarily. Influence points are how the player can get access to new heroes without spending real money to do so, and can also be spent to purchase runes, which are yet another way to enhance hero stats. The practice mode is my preferred way to play LoL these days. As is usually the case, video of a game in action does more justice than words, so a small clip of game-play with some bots can be found below. Here's me PWNING some Stupid Bots. It's actually pretty fun. If that was a “real” game, I would have been metaphorically chewed up, spit out, and then defecated on in the game, by players on both teams. I will be surprised if youtube comments to this video wont backup that sentiment. I don’t know what the deal is with DOTA and its games it has inspired, but they have the absolute worst gaming communities I’ve ever seen, and I play everything. Since I’m trying to keep this blog relatively professional, I can’t even begin to accurately display just how scummy and vile the community surrounding LoL and similar games really are. Kids with cracking voices playing unhealthy amounts of FPS games seem downright civil next to many of the players of these games. The thing is that I think the way that these games are designed encourages their anti-social behavior. The first issue is that dying to an enemy player makes them stronger. After a few deaths a sizable advantage emerges that cannot be easily overcome as the person repeatedly dying has “fed” the opposing team experience and gold. This effectively leaves little room for mistakes on the part of the players. Second, the open means to achieve the end of the game is problematic. I’ve had armchair generals telling me that my build order was dumb when I was outperforming them in the game. I’ve had enemies complaining that my “backdoor” tactic of attacking unattended towers was a “scrub” move that would never work in “pro games,” when clearly we were all in a match-making Pick-up Game (PUG) that was nothing close to a truly competitive match. Everyone has their own opinion, and even in the face of irrefutable evidence like victory, their opinion is better than yours. Though it is amusing to watch some of these LoL players ultimately insult themselves for losing to “scrub” strategies performed by a terrible player like myself, it really gets tiresome and is detrimental to the core gaming experience. Not that Riot Games really cares. Just looking at their business model of selling playable heroes and hero skins for exorbitant amounts of money that would make Microsoft Xbox LIVE Avatar marketers blush is enough to show that LoL isn’t targeting an educated, let alone intelligent, base of gamers. 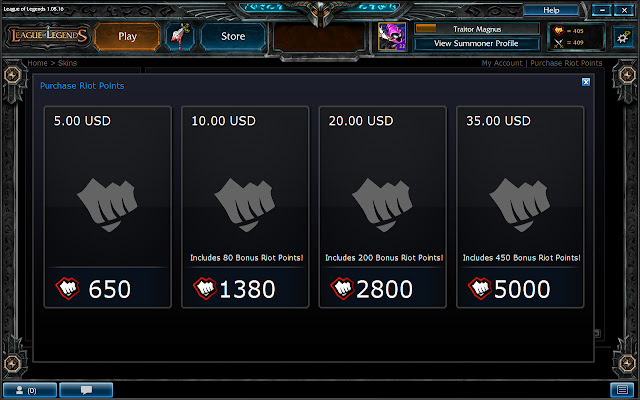 League of Legends would be a great game for LANs if there was no grinding or pay-to-play mechanics involved beyond just buying a disc with all the content on it and available. 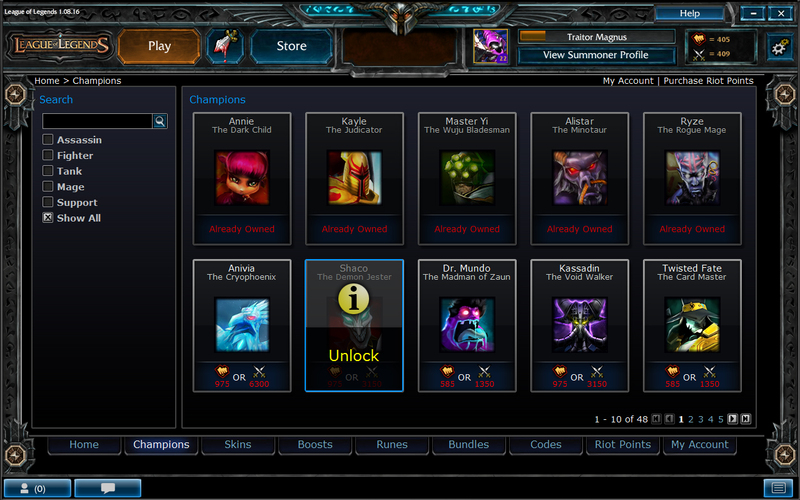 Unfortunately, LoL is just mediocre. Hmm... Still looks like a Ripoff even with Pretend Money. As this quirky genre expands its tendrils into other styles of gameplay, like first-person shooters as Monday Night Combat seems to be doing, it will be fun to watch the evolving discussions. Currently, there’s no set name for this genre that encompasses DOTA, LoL, and the latest entry Heroes of Newerth, as various forum threads and even Wikipedia discussion pages capture. As a fan of general chaos, watching all this “meta” strife is incredibly satisfying as the game developers and their rabid zombie fans try and push their ideal label for marketing, be it Multiplayer Online Battle Arena (MOBA) or RTS Arena, on everyone else. Hopefully Monday Night Combat (if it comes out for PC) will prove to be a better experience all around, with a community that I can accurately portray in good company. In terms of combat BioShock 2 (BS2) is pretty fun, but it is taken way too far. One stage in particular, Dionysus Park, basically existed for the transparent purpose of killing splicers and defending little sisters. In the 18 or so hours I clocked in on the hard difficulty this felt like a slap in the face after a few minutes of the level. This was particularly painful because the story was otherwise really good and the other levels didn’t feel nearly as forced in this regard. The core story of BioShock 2 involves family matters, more so than the first game did, and the relationship seems much more… healthy as well. Thematically, this family bond that’s presented in BioShock 2 was a good design decision as so many other games ignore this important and prevalent facet of being human. The statement that was so strongly made in BioShock when the player comes face to face with Ryan was incredibly mean-spirited and negative, and it really resonated with me. 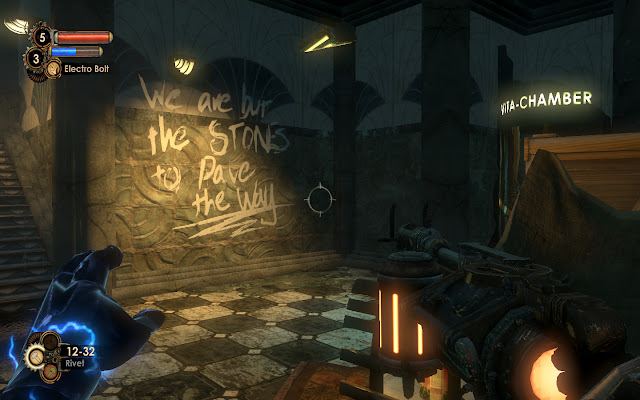 But BioShock 2 makes a similarly heady statement, if not with a more subdued voice. Instead of making me want to turn the game off, put my controller down, and take a shower though, BioShock 2’s message was positive, redeeming, and made my eyes a wee bit watery from emotional impact. Few games can effectively manage this well, and that a sequel could do it when it seemed like a cheap money grab really took me, pleasantly, by surprise. The meager choices from the original BioShock, in how one deals with little sisters or reacts to mortal character NPCs, are back in BS2; in terms of the game-play these choices are just as stale. However, the “good” ending that I received felt much more rewarding and involved than the montage of distant scenes in the future that were the extent of BioShock’s endings. Even though it really boils down to almost superficial differences in presentation and detail, I was nonetheless impressed by this game again. Another thing that BS2 blindsided me with was that, except for its narrative and visual style, BioShock is otherwise pretty forgettable in regard to game-play mechanics. So much so in fact that to save my life I couldn’t begin to explain which weapons or plasmids are even new to BS2, or how any previously existing ones have been modified, save the wrench being exchanged for the drill. As fun as BioShock was, only so much of it was actually unique in terms of what it had to offer, and BioShock 2 is no departure in that regard. You go around and take care of bad guys, run errands for people you need cooperation from, and harvest resources to make you more powerful. 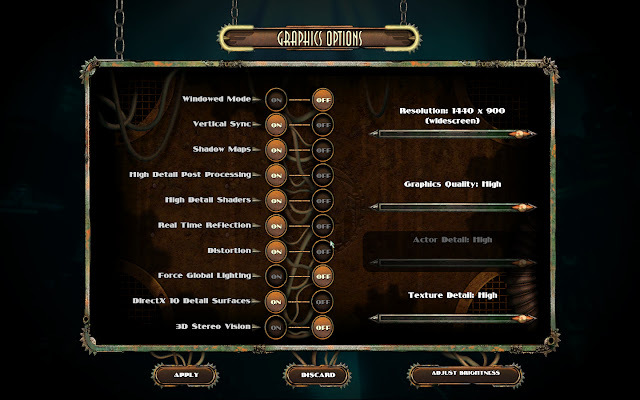 The plethora of means that the BioShock games provide the player doesn’t change the ends. I may be spouting heresy here, but I think this point is worth considering, especially when a game like BioShock can garner so much devotion just for having thoughtful themes (the likes of which are studied in English literature) ingrained in it. If more games are treated like art instead of Hollywood blockbusters I wonder if that wouldn’t automatically make games better? Glitch-wise, BS2 gave me quite a few headaches. There was an issue where I couldn’t get my key re-mappings to stick so I had to go in and manually edit a config file. After I did that, in-game prompts didn’t update to display to correct keys which was annoying, and the re-scavenge key to reload the loot on corpses never did work properly for me. Lastly, BS2’s integration with Games For Windows LIVE caused me serious grief as I couldn’t get the game updated properly; you can read more about that experience here. After having completed BioShock 2, I’ve been having fun with some of the controversy surrounding it. I really think that BioShock 2 would have benefitted from having controller support, especially with the use of guns in the right hand and plasmids in the left. The kicker here is that your mouse buttons are then flipped by default, and when you’re playing many games at once like I tend to, using a fire key on the rightmost mouse button for one game is going to mess me up. With triggers there would have been no issue, and that’s what the game felt designed for. No inclusion of controller support is really just sheer laziness on the part of 2K. There’s also been some on-disc DLC for BioShock 2. Whatever, I’ve beaten the game, enjoyed a good story, and I’m just not interested right now in going back to BS2. It’s really too bad and it’s not really 2K making a show of good faith for their customers, a sizable portion of which seem to think that BS2 doesn’t even really deserve to exist. I initially thought this same way, but then considered just how bad of an opinion it is. I’m tired of cliff-hangers, and I’d like to see more definitive endings to games. As such, I don’t want to see any franchises punished for taking this approach. With the story that BioShock 2 has to tell, I won’t make the assumption again that something doesn’t need to be revisited.